Many missionaries work in churches which don’t have a sound system, yet they still want to make recordings of their services. A portable digital voice recorder is a great option. There are many recorders to choose from. Making the right choice can seem daunting. Knowing about some of the features which are available on different recorders will help narrow down your options. Compressed audio recording. Example of formats are MP3, WMA, OGG, etc. Uncompressed audio formats are WAV, PCM, etc. Many recorders can do both compressed and uncompressed. Memory technology may be built in or removable cards. Formats include SDHC, CF, MemoryStick, etc. Battery type? AAA, AA or proprietary battery packs? 110V or 220V options available for the power brick. Some recorders can be voice activated. Basic audio editing on the device. Consider operating system compatibility. Windows, Mac or Linux. Multi-track options. 2, 4, 16 or more? External microphone inputs. These can be XLR, 1/4″ TRS, 1/8″ stereo. Also note that they can have more than one. Size. Compact or full size? These are just a sampling of items you want to consider when purchasing a digital voice recorder. Here are some thoughts on some of the items from the list above. Many recorders will record both compressed and uncompressed audio. Compressed audio takes up less space on your memory card, but is usually of lesser audio quality. Depending on your use, compressed audio may be perfectly fine. If you are going to edit the audio then you should consider recording in an uncompressed format and then output your final product as an MP3 or similarly compressed audio file. When buying memory cards for the device, if it has expandable memory, you want to ensure that the memory capacity is sufficient for the amount of recording you need to do. If you have access to a computer that you can download the recordings to, then a 2 GB memory card (small by today’s standards) will easily record a few hours of audio before needing to dump the files onto your computer. Find a recorder that uses the same kind of memory as other devices you own like a digital camera or video camera. This lets you swap between devices as necessary. Just make sure that the camera or recorder does not format the card and erase everything before it can be used. Otherwise you will lose the pictures or recordings from the memory card. Recorders are limited on the capacity of memory which can be used in them. Make sure you buy a memory card that does not exceed that size limitation. Consider buying a recorder that uses batteries that are readily available where you live. If it will only take a proprietary battery pack, then you should buy at least one extra pack. Also, make sure the power cord can handle 220V if you will be using it in a country that uses 220V. The smaller the device the easier it will be to carry with you. But, you usually sacrifice features with a smaller recorder. The quality of the final recording may be just as good with a smaller unit, but obtaining the recording may require some awkward button combinations. A larger digital recorder will have dedicated buttons for common features. The best recorders have built in mics as well as the ability to plug in an external mic or two. Buy a recorder that will accept the mics you already have available. If you are buying a high dollar recorder and want to get good sound with an external mic, you need to be willing to spend an appropriate amount of money for the microphone. There are many good digital voice recorders. Yet there are three that seem to rise to the top. These are not cheap devices. There are lesser expensive recorders which do a good job, but these three are ones that are regularly recommended by people doing recordings in the field. All three of these devices sell for less than $300 at Amazon. Zoom H4n The advantages of the Zoom H4n is that there are microphone inputs for two external XLR or 1/4″ TRS microphones. There are also built-in stereo mics which do a good job in most conditions. The built-in mics are not the best quality available, but they do very well. The big negative of the Zoom H4n is its notoriously clunky menu navigation. Edirol R-09HR Loved by podcasters for both studio and field recording, the Edirol R-09HR has very good stereo microphones built in. If you are recording using a lapel mic then the 1/8″ mic input will work just fine. However, there are no inputs for XLR mic cables; meaning that you have to go through $3 adapters to use your $150 microphone. That is a potential point of failure in your audio quality. Tascam DR-100 If you are going to use built in mics for the majority of your recording, you probably can’t do much better than the Tascam DR-100. The mics on this device are very high quality. Like the Zoom H4n, there are two XLR microphone inputs for stereo recording; however, the Tascam DR-100 does not have 1/4″ inputs. There is a built-in battery, but the unit also accepts AA batteries. As mentioned, there are cheaper devices, but these have a great quality to price ratio. Because they are not super-compact, they are much more flexible when it comes to what can be done with the recorders. Besides recording church services, a digital voice recorder can be used to record testimonies of your church members for future playback. You can also use them to record audio updates for your supporting churches. The quality of the ones mentioned are excellent for recording the audio of your next furlough presentation. Voice recorders are also indispensable tool for language study. Their fantastic for recording session with language helpers and doing pronunciation drills, etc. I couldn’t do language study without one. Even after speaking Spanish for several years, I still record stuff from native speakers to listen to and study. Recently I got a group of friends over at my house and had them all quote and read various Psalms so that I could specifically study their cadence in the way they say things when reading and quoting. We recorded our Moroccan Berber NT using a Shure SM58 mic with Behringer Xenyx502 mixer and creative soundblaster into a computer, saving the input as WAV files for editing with Audacity. There is a slight hiss throughout. Would you advise using the Shure mic with a digital recorder to create the WAV files? Or is there a better way to link the mic with the computer? Many thanks. You can go directly into the computer, but the analog input is probably what is causing the hiss. 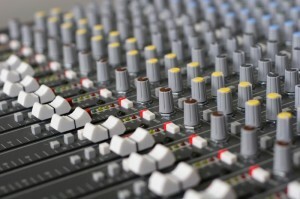 Meaning that going out from your mixer to the computer through the mic or line in input of the computer is where the problem is. You would do better to go from your mixer to a USB interface into the computer. Something as simple as this less than $10 USB sound card should take care of the hiss. You can also remove the hiss using the “Noise Removal” feature in Audacity. Depending on the consistency and nature of the noise, you may have very good or horrible results with that. You will get much better audio into the computer if you use a USB based headset. Or, even a simple USB audio converter that will take the 1/8″ plugs and digitize the audio coming in. If you only have an analog headset, then you will need to go through a mixer and/or an amplifier to get the sound boosted for the computer. But unless you have a full-sized sound card with a line in jack, you will still probably have problems. And, computers are notorious for introducing noise on the analog audio lines. This is much more of a problem with notebooks. Should You Record to Your Computer or Voice Recorder? « Should a Missionary Use Free Website Hosting?